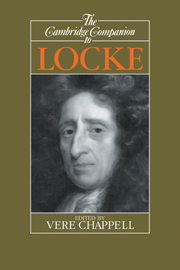 The essays in this volume provide a systematic survey of Locke's philosophy informed by the most recent scholarship. They cover Locke's theory of ideas, his philosophies of body, mind, language, and religion, his theory of knowledge, his ethics, and his political philosophy. There are also chapters on Locke's life and subsequent influence. New readers and nonspecialists will find this the most convenient, accessible guide to Locke currently available. Introduction; 1. Locke's life and times J. R. Milton; 2. Locke's theory of ideas Vere Chappell; 3. Locke's philosophy of body Edwin McCann; 4. Locke's philosophy of mind Jonathan Bennett; 5. Locke's philosophy of language Paul Guyer; 6. Locke's theory of knowledge Roger Woolhouse; 7. Locke's philosophy of religion Nicholas Wolterstorff; 8. Locke's moral philosophy J. B. Schneewind; 9. Locke's political philosophy Richard Ashcraft; 10. Locke's influence Hans Aarsleff.